Stock markets have been hit by a severe case of March mediocrity. Investors can't seem to get excited about equities this month, with each of the main U.S. indexes showing losses. The tech-focused Nasdaq has fallen by nearly 2% this month, and the Dow Jones industrial average and S&P 500 are also off by 0.3% and 0.1% respectively. There's little to suggest a major change in mood Tuesday with U.S. stock futures showing only very slim gains ahead of the opening bell. "With a few days left in Q1, this year continues to feel like one where its one step forward and then one step back with little momentum building," wrote Deutsche Bank analyst Jim Reid, in a market report. Still, housing market data will be watched for clues on the health of the economy. The S&P/Case-Shiller 20-city home price index will come out at 9 a.m. ET. The U.S. government will also report February new home sales at 10 a.m. Meanwhile, the Conference Board will publish its consumer confidence index at 10 a.m. In corporate news, investors will be watching Walgreens (WAG) and Carnival (CCL), which will both report results before the opening bell. Shares of Sonic (SONC) rose after the bell after the drive-in restaurant operator reported earnings that beat Wall Street's expectations. U.S. stocks fell Monday. The Nasdaq dropped by more than 1%, with shares in Netflix (NFLX), Zynga (ZNGA), and LinkedIn (LNKD) taking a beating. 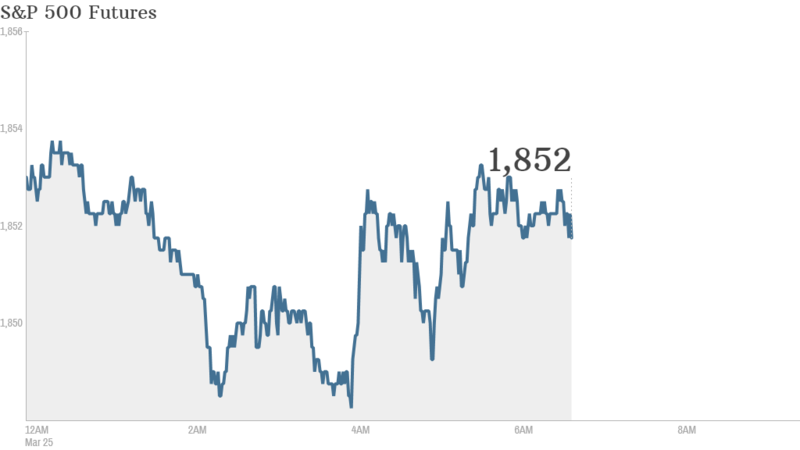 European markets were all pushing up in morning trading. The London FTSE 100 index was leading the way with a 1.1% gain. Investors seemed undeterred by a survey out of Germany showing a decline in business confidence. Company managers said they were feeling less optimistic about future business developments, in part because they were worried about the fallout from the Ukraine crisis. Asian stock markets mostly ended in the red, though the moves down were modest.